Railpictures.ca - Stephen C. Host Photo: Signal 428: Stop and Proceed. Framed in an old wooden farm bridge, Sentinels stand guard on the double track CP Galt Subdivision as train 650 heads east on the south track. The north track displays this aspect by default when no trains are lined. Curious if anyone knows if there is any actual meaning in this case. | Railpictures.ca – Canadian Railway Photography – photographie ferroviaire Canadienne. Caption: Signal 426: Restricting. 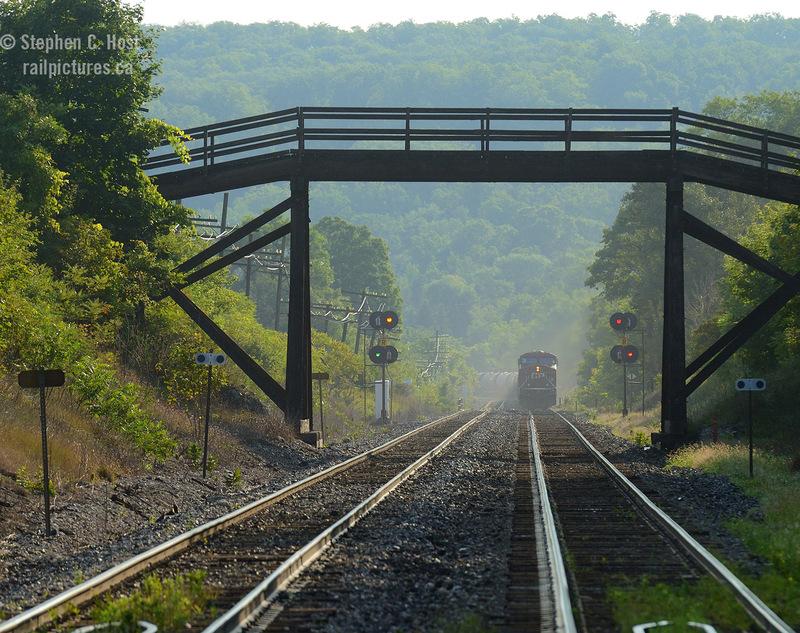 Framed in an old wooden farm bridge, Sentinels stand guard on the double track CP Galt Subdivision as train 650 heads east on the south track. The north track displays this aspect by default when no trains are lined. Curious if anyone knows if there is any actual meaning in this case. The CROR-2016 has 39 different signals shown. More than twice the number we used in the UCOR-Rev.1962, only 17 shown in there. I have an old (July 1929) Operating Rules for CN that I picked up at a second hand sale. Only 6 ABS signals to learn at that time. Stop, stop and proceed, approach restricting, approach, clear restricting and clear signal. All with appropriate display of semaphore arms for each signal. Things have changed considerably in 90 years. Remembering 39 signals will be a bit of a task. There will probably be more than 39, during my time there was always one or two extra to learn in the special instructions. Thank you. I always wondered how block signals “default” as these do. Would this be changed by the state of the absolute signals since they would be all red at Milton West and Guelph Junction East? So they simply display the natural progression of signals toward a stop between these two points? Appreciate the explanation from the informed types! Nice use of the DP unit Mr Host. The indication on the south track is actually “Restricting” thanks to the R plate between the lights. The indication on the North is “Clear to Medium” meaning, proceed approaching next signal at medium speed (a speed not exceeding 30MPH). There is probably another intermediate signal east of it and before the next controlled block signal that likely defaults to clear to stop when nothing is lined up.